American DJ H20 DMX Pro LED Water Effect DJParts - All Variety of Parts that DJ Needs. The American DJ H2O LED Pro is a multi-colored simulated water flowing effect with DMX-512 control and a bright, 50W LED source. The unit produces almost no heat, requires very little power (69W max) and can be used all night long. The LED is rated at 30,000 hours of use. This popular effect now offers professional features such as: full DMX control of the glass wheel, color wheel and dimming, 4-Button DMX Display, and the ability also operate in 3 different modes (DMX, Sound Active and Master/Slave) or from the easy-to-use UC3 controller. The unit comes equipped with two interchangeable lenses (34 and 52-degree) depending on how wide of a beam is required for your event. Users can daisychain up to 5 units together not only through the XLR DMX links, but through the IEC In/Out power links as well. There’s no end to applications for the H2O LED Pro. Water flowing effects can add a unique visual dimension to nightclubs, bars, restaurants, shows, music performances, and even displays and special events. 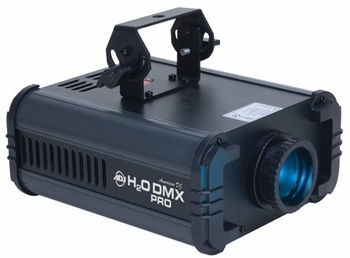 The H2O LED Pro can be used with or without the use of fog. Designed to project on walls, ceilings or floors with or without fog – great for mood or background lighting 3 DMX Channels (Dimming, Glass Wheel, Colors) 3 Operational Modes: DMX, Sound Active & Master Slave Digital DMX Display with 4-button menu for easy navigation Equipped with 2 Glass Effect Wheels and 1 Independent Dichroic Color Wheel 6 Dichroic Colors: Orange, Green, Blue, Yellow, Purple and White High-tech plastic molded ends protect unit during transport and day-to-day use 0-100% Dimming (via DMX) Adjustable Focusing Lens Beam Angle: 34 or 52 degrees (Includes 2 replaceable lenses to change beam angle) Includes Hanging Bracket Run All Night – Units stays cool – No Duty Cycle IEC In & Out to Daisy-chain Power (Connect up to 5 H2O DMX PRO) 1/4” input for optional UC3 remote control (sold separately) Fan Cooled Safety Hook on rear panel Power Consumption: 69W LUX @ 3M: 1800 (34-degree lens), 1100 (52-degree lens) Long life 50W LED Source (30,000 hr. rating) Multi-voltage operation: AC 120-240V 50/60Hz (IEC Plug) Dimensions (LxWxH): 11.5”x8.75”x4.75” / 292x236x121mm Weight: 9 lbs. / 4 kg.